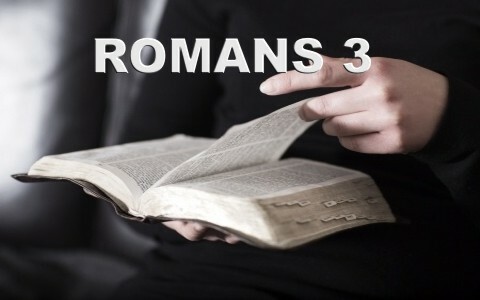 Let’s take a close look at Romans chapter 3 and study it together and add some personal commentary to it. Please leave your own comment so that we can all learn from one another. The Book of Romans is among my favorites in the entire Bible. This book has caused many to come to saving faith as they are walked down the Roman Road of Romans 3:23, Romans 6:23 and many others. Written somewhere between A.D. 55 and A.D. 57, Paul wrote this letter or epistle which today we call the Book of Romans, while he was in Corinth and possibly staying with Phoebe (16:1-2). Paul felt that his ministry may have been fulfilled in the areas around Judea and the Mediterranean and so he desired to eventually go to Spain (Rom 15:17-24). The Reformers saw this book as the key to the Great Reformation because it holds all the essentials of salvation like the cross, sin, repentance, the law, judgment, faith, works, grace, justification, election, sanctification, the role of Christ and the Holy Spirit in the church and in the life of the believer as well as the place that the Jews and Gentiles held in God’s election, so let’s examine the 3rd chapter of the Book of Romans together. There is no advantage to works like circumcision but there was to being a Jew who not only recorded but preserved the Word of God (the oracles). Their unfaithfulness didn’t nullify the faithfulness of God at all. As you see in the wanderings in the Wilderness, God was faithful even with His people were not. God is always true as He cannot lie like humans often do. These verses are rich in the message of the gospel acting as cobblestones in the Romans Road to salvation. There isn’t even one person who is righteous; no one does good at all…not even one of us! Every one of their and our mouths were open graves before they/we were saved. Like you, my feet ran swiftly toward sinful activities and I had no peace at all. There was no fear of God before our eyes, much like the unsaved today, but then the law exposed our standing before God. Our words couldn’t justify us so we had to shut our mouths and stop trying to justify ourselves. It is for this reason that the whole world will be held accountable to God unless they repent and trust in Christ. The best of our works cannot justify us. The law’s purpose is fulfilled in our lives in the sense that it showed us what sin was. Paul said it well when he wrote that it was our schoolmaster, bringing us about to knowledge of sin (Gal 3:24). God’s righteousness is revealed or displayed apart from His law but it is displayed through having faith in Jesus Christ for anyone that believes. There isn’t any difference between any of us because all of us have sinned and fallen so far short of God’s glory to be as good as humanly unbridgeable. That’s why it must take a free gift, freely received, and that is the gift of faith which could only come through Jesus redeeming the unredeemable. God had to satisfy His wrath on Jesus, and this is what propitiation means. It involved His suffering, the shedding of His blood, and His death and it did satisfy God’s wrath and that is why it can only be received by faith. This was how the righteousness of God was displayed…in His great patience or forbearing of our sins, it was just as death passed over the first born of all those who believed God in Egypt, so those who believe in Christ today have had His deadly wrath pass over them. This passing over, made possible by Christ’s work at Calvary, is the passing over of our sins and the punishment we deserved. This is how Jesus is both the just and the justifier. God is the Just One and the Justifier and those who have faith in Christ are the ones who are justified (2 Cor 5:21). The is law given to the proud and only when they are humbled by it, can grace be given, therefore no one could possibly boast about it (Eph 2:8-9). Who has ever been justified by the law or without faith? No one! God is the God not only of the Jews but also of the Gentiles because more than these, He is a God of grace and not of race. For whoever it is that trusts in Him, He is their God. That doesn’t mean that the law is null and void but we live by the law because Jesus Himself said if you really love Me, you will keep or obey My commandments (John 14:15). Our love for Him and our faith in Him doesn’t mean that we don’t obey Him. That is contrary to the Word of God. If you want to share the gospel, you must understand the Book of Romans and chapter 3 is a huge part of the Romans Road to salvation, especially Romans 3:10-12, 23. It should be used to humble the proud, bring them to the knowledge of their sin, allow them to see the sinfulness of all mankind, the wrath that abides on all who disbelieve, that no amount of doing good will ever justify a person, that the law should take away any excuses, and when they are finally humbled, and not before, tell them that they can only be saved by the free gift of God which is faith in Jesus Christ. There is no other way a person can be saved. Take a walk through this related article: What is the Romans Road to Salvation? I enjoyed reading this, thank you for sharing it with us. You are so kind sir. Thank you. I love the Book of Romans so much. Romans is splendid, I find strength in 8:37-39. It’s a rock in hard times and when I sin this I know to be the truth and repentance is always the next step. Thank you for your articles, I’m always in need of teachers. You are so kind Viviana. I too love the Book of Romans…it is one of the most powerful books and has led many people to Christ. It was a blessing to read about book of Romans. Thank you Pastor for the help. Hello Mr. Maina. Jesus says whoever comes to Him, will not be turned away (John 6:37-39) and whosoever chooses to believe has eternal life (John 3:16). That’s how the Bible works. It works for the vilest of sinners like me and for the saintly woman next door who doesn’t yet know Christ. God’s ways are beyond comprehension, but the clear things are the main things (Acts 4:12; 16:30-31). I hope that helped. Philippians 2 shows what Christ endured and Isaiah 53, but Jesus never asked, “Why?” All things for HIs purpose and our best (Rom 8:28). That’s how it works my friend. Romans is such an eye opener for I have struggled a lot !! God bless!